with stop watches timing our progress. There are various sources of Grief. process is basically the same. You may wonder if you will ever get over losing someone who means so much to you. 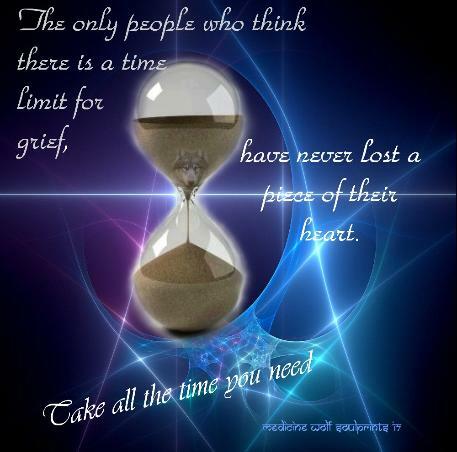 are a normal part of the grieving process. very similar process for those experiencing a separation or divorce. journey. 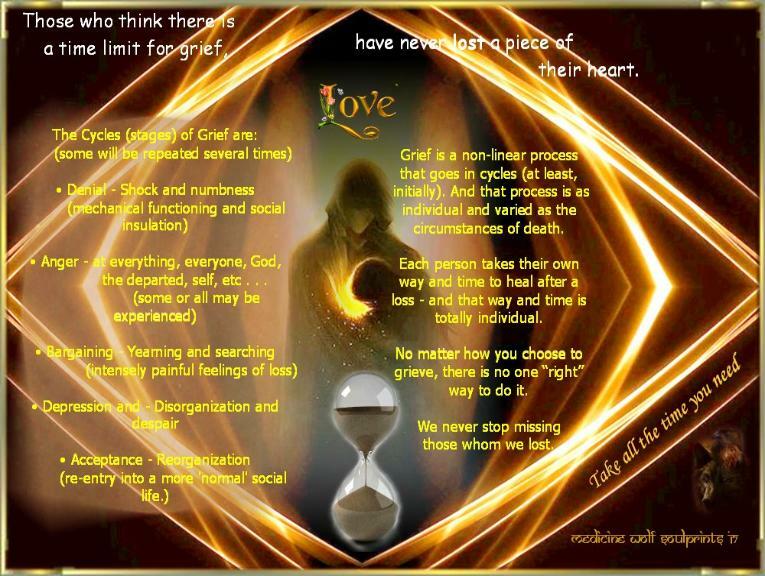 Each of us grieve in different ways. bereavement tasks. Others need longer. (self-blame). This stage can also last a long time. away the loss?" The anger may be increased when this doesn't happen. anger and sadness may remain underneath. This may last a long time, too. simply accepts the reality of the loss (can take a short to very long time). * Do not force me to make quick decisions. * Let me act strangely sometimes. * Let me see that you are grieving, too. * When I am angry, do not discount it. * Do not speak to me in platitudes. * Listen to me, please! Taken from the book How Can I Help? Grieving by June Cerza Kolf. Dealing with guilt, real of imagined. * Associate with old friends also. * Record your thoughts in a journal. * Turn Grief into creative energy. * Take advantage of a religious affiliation. * Get professional help if needed. (If you prefer to hear him singing it, here's the Link. traumatic. There is no way to prepare. that a family can experience. professionals who are ready to listen (and I'm here). insights about death - through the eyes of a child. the Life Transitions page, to be helpful. five stages, regardless of the order or sequence: this is normal. - that too, is normal; and there is no time limit. a neat list with absolute definitions, time-lines, strategies, goals, and completion dates. going in circles, yet you are actually making progress. painful until they move to the fifth stage - acceptance. emotions flow through the stages of grief. a time of war; and a time of peace.